The final unveiling of the UK's Strategic Defence and Security Review this afternoon has, predictably, raised as many new questions as it has answered. And there are no more areas more sketchy and vague in the 76-page final report than the British government's commitment to - or even understanding of - unmanned military aircraft. There are nine references in the Review to unmanned aircraft or UAVs; four of those are in the glossary, and three are vague mentions that this is an area where the capability is necessary, will grow and will be invested in. That leaves only two mentions in the document which go beyond the superficial. The first one merely confirms that the Army will have the Watchkeeper system, which flew in the UK for the first time this April, available to them. This is hardly news. Watchkeeper, an autonomous (meaning it'll fly by itself, rather than needing the constant attentions of a pilot) development of the remotely piloted Hermes 450 built by Thales, has for some time been the only unmanned aircraft system in the MoD's core budget. So the mention of Watchkeeper in the Review simply confirms that an extant plan is being kept to. In questions following his speech commending the Review to the Commons, David Cameron spoke enthusiastically of the role being performed by unmanned aircraft in Afghanistan. While a great deal of that is being done by Watchkeeper's Hermes precursor (under a leasing arrangement with Thales which means the MoD don't own any of the hardware), much is also being done by the RAF's Reapers, launched from Kandahar and flown by RAF pilots in control centres at Creech Air Force Base in Nevada - and those aren't part of the MoD's funded budget either. They have been bought under Urgent Operational Requirement, a system of procurement designed to quickly tackle emerging needs and deliver equipment to front-line troops. There is no mention in the Review that Reaper will become a core programme - so it would appear that, strategically, its use is considered limited to the present conflict. 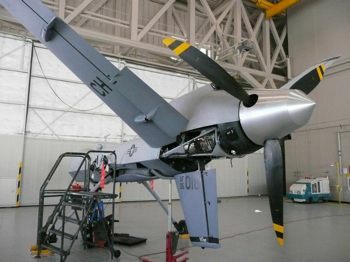 Certainly, to attempt to put Reaper - or, for that matter, Watchkeeper - to work in an environment with even a moderately functional ground-to-air or air-to-air defensive capability, such as existed in Saddam-era Iraq or in the Balkans, and the slow, easy-to-spot-on-radar aircraft would be pretty easy for a defending military to shoot down. In the acreage of ridiculously ill-informed opinion published ahead of the Review, the implication that "unmanned" is a synonym for "superior" has been one of the most bewildering constants. True, if an unmanned aircraft is shot down, the pilot isn't going to be killed (unless he happens to be underneath it when it falls out of the sky). But there are still many jobs that remotely piloted aircraft can't do, and as yet there are no remotely piloted aircraft in production - as far as we know - which can evade radar detection. One that can is BAE Systems' Taranis, but that wasn't the first of a planned production type, it was a one-off designed to show that the UK's technology and defence sectors could produce an aircraft system of this nature. It could become a production system, as could BAE's other major unmanned technology demonstration aircraft system, Mantis, but as yet there have been no orders for either. The SDSR does not change this, and in a question in the House this afternoon, Cameron avoided giving an answer about whether further MoD investment in Taranis would be made. Which brings us back to that last, ninth mention of unmanned aircraft in the Review. It's on page 61, in Part Five, under Alliances and Partnerships. And the alliance referred to is not with the US, but with France. This might be particularly interesting to followers of Taranis, because France has also been developing a very similar-looking system, called Neuron. The work of a multinational consortium led by Dassault, Neuron hasn't got as far as Taranis, which was rolled out for a smoke-and-strobes meet-and-greet with press in July. But Dassault, in accordance with France's robust anti-secrecy laws, have unveiled a great deal more information about Neuron than BAE have done for Taranis, and the project's multi-national make-up does suggest that more than one nation might possibly have reasons to buy it. If it does something similar to Taranis (and Neuron is expected to fly at up to Mach 0.8, with an unrefuelled time in the air of three hours, and a notional payload of up to 2000kg) and there are lots of orders, it will be considerably cheaper for the UK to buy than Taranis may end up being, given that both systems will have required similar investments in research and development. In a Defence Review that has such far-reaching consequences but which is so difficult to wring hard facts out of, is this the Lib-Con coaltion's way of announcing they're going to be buying Neuron and abandoning Taranis?